At last after so many rumours Samsung this time decided to uncover the Galaxy S5 revealing date to us. The Korean giant’s next major mobile product announcement will take place this February, on February 24 in Barcelona, right at the MWC kick-off. That’s the least expected date and I place I believe according to many experts. 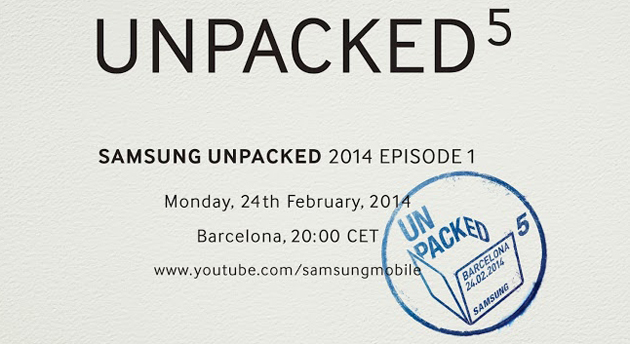 The invitations contain more than a subtle hint that the Samsung Galaxy S5 will break cover during the event. They have the number 5 on display which is as clear a suggestion as it gets in our book. The same source also claims that Samsung has decided to keep it simple in terms of new software features, after many of the new features such as Air View on the Galaxy S4were considered gimmicky by critics. Instead, the company will focus on other features to make the device more attractive to relatively untapped audiences, such as business users, with features such as the KNOX security suite. While that’s certainly good news, as it could mean the S5 won’t add too heavily to the already existing bloat on Samsung devices, it might also come as disappointment to those who like to modify their phones’ software, as Samsung’s current implementation of KNOX has already caused enough problems with simple things such as getting root access. A potential appearance of the Samsung Galaxy S5 during the Mobile World Congress guarantees it a great deal of spotlight. Samsung was relatively quiet during last year’s MWC and did not announce any flagship products. The Galaxy S5 is expected to sport a 5.25-inch display of 2K resolution, an Exynos 6 octa-core / quad-core Snapdragon 805 processor, 3GB of RAM, 16-megapixel rear camera, 3.2-megapixel front-facing camera, 32/64 GB of storage and a microSD slot, a 3,200 mAh battery, and Android 4.4 KitKat with a refined user interface. It will come in both a metallic and plastic variant, most likely with a fingerprint scanner on-board, and launch in markets sometime in March. These all are speculation at this moment. So we are not certain about all of these.